Today we’re reporting on inland Istria where we’ve just spent a very enjoyable five days over Christmas. We stayed at The Leader in Lupoglav and couldn’t have wished for a better location or ambience. We were also very lucky with the weather – no snow this year but clear blue skies throughout. Our accommodation was a Kažun, a round stone house. Although traditional in style, the Kažuns provide for all the necessities of modern living, including air conditioning, ensuite bathroom and a mini bar, with the added delight of a big open fire. Bear in mind that, with the circular design, it’s not easy to fit in too much extra furniture and cupboard space, over and above the essentials. The Kazun’s are part of a large plot of land that includes horse riding stables, fields, a small animal farm (rabbits, ducks, peacock, etc) and a restaurant. We chose the half board option which, at around £24 a head excluding drinks, is extremely reasonable for accommodation, a cooked breakfast and an evening meal. On this option, for the evening meal, you will normally get soup, a pasta main course, a serve yourself salad from the salad bar, and a cake for desert – hearty Istrian food, mostly home produced. If you’d like a little more variety then go a la carte. The home baked bread is delicious as is the home made pasta. The staff can’t do enough for you and Istrian cuisine makes a very refreshing and distinct change from its Dalmatian counterpart. The countryside is spectacular with the Učke Nature Park nearby and rolling fields, pine forests and mountains all around. Istria is a relatively small region, Lupoglav is fairly central and is therefore a great base to explore from - you can get to almost anywhere along the Istrian coast or inland in about half an hour. The medieval hilltop villages are very different from the coastal villages and you won’t run short of fascinating places to visit. Our favourite town was Motovun, which also hosts the summer film festival. Hum claims to be the smallest town in the world, Grožnjan has become a village of artists with a gallery around every corner, and there’s Buzet, Roč and numerous other towns and villages to add to the list. And if you tire of sightseeing then try out your riding skills in the ménage or on a countryside trek. Croatia Online - Happy Christmas! 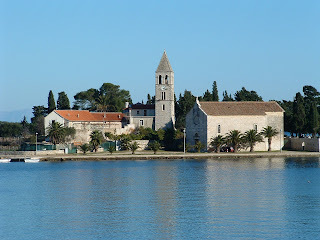 This picture may not look very Christmassy but we took it in Vis town on Vis island, where we spent Christmas 2003. We were the only guests in the only hotel open but had a good time none the less. This year we are off to inland Istria to stay in a Kažun, which is a round stone traditional farmers cottage with an open fire. We'll tell you all about it on our return. You may have realised, from the reduced frequency of postings over the last couple of months, that things have been pretty hectic for Croatia Online. We're working hard on next year's Time Out Magazine for Visitors to Croatia, which will be on sale in April 2007. There are new restaurants, hotels and activities opening up all the time in Croatia and it takes a lot of research and energy to keep pace with all the news. Time Out has a reputation for being bang up to date, discerning, factually correct, a cracking good read and at the forefront of the latest news and fashions so there's no time to lose! We'll be updating you on all the latest destination news early in the New Year, as well as looking ahead to the start of the tourist season and reviewing lifestyle issues. So it just remains for us to wish all our readers a very Merry Christmas and a Happy New Year. Or, Sretan Božić i Nova Godina, as the Croatians say. Croatia Online - Ryanair Flies to Zadar? Lošinj Island - First Impressions: Immortelle! Learning The Croatian Language – Why? !